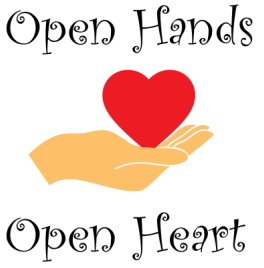 The History of "Open Hands, Open Heart"
​In November 2004 my sister Dee, who lived in Florida, was going through some hard times. Dee came to Saco to live with me and my partner JoAnn. Our goal was to help her get on her feet. During her stay with us, Dee wanted to contribute what she could to help out. We saw an article in the Courier about the Saco Food Pantry. They were moving from the storefront on Route One to where they are now on Cumberland Ave. Dee wanted to go to the pantry to see if she could get food for herself and help with the food budget. While we were waiting to be served, Dee stated to me "Why don't you see if they need any volunteers". I thought why not. I was not working at the time. So in 2005 I became a volunteer at the Saco Food Pantry. Dee was able to utilize the assistance of the pantry from January through June of 2005. Dee was always grateful to the Saco Food Pantry and vowed that, when she got on her feet, she would repay them. Unfortunately, Dee never got on her feet. In July of 2005 my sister Dee took her life. In 2008 I started going through my own struggles in my personal life. At this time I had to find a job quickly and try to refinance my home in hopes of keeping it. I worked hard to keep a positive attitude and knew in my heart that, whatever happened, it will all work out. I joined a group in Grey, Maine called " Thank God It's Grace". I met a woman at this group that totally inspired me. She was the founder of "Project Grace" in Scarborough, Maine. I had taken a short break from volunteering at the food pantry. When I did return in 2008, I knew I wanted to do more than what I was doing for them. I met many times with the founder of Project Grace who guided me in my endeavors and encouraged me. I worked with the families who were clients at the Saco Food Pantry and tried to be of service with referrals to outside agencies in the community that may be of help to them. I soon learned that I did not prefer to deal with adults. The job that I had to get quickly turned out to be driving a school bus. It didn't take me long to see the need to focus on kids. In October of 2008 I started talking to folks in the community and guidance counselors to see what the needs may be for our kids. With winter coming, I decided I would collect warm clothing for kids and distribute them through the food pantry. I had asked the Saco Food Pantry if they would allow me to use an area for children's clothing and they agreed. I could not get the clothing on the shelf. As soon as I walked in people were saying " Oh! Could I take that for my grandson. He really needs a pair of boots". And on and on it went. I knew the need was there. In June of 2009, I met with a reporter from the Courier and told her my story and the plan to collect children's clothing. In that article I asked for volunteers to come forward and help. I had 6 people respond to the article and we went forward. We got information out to the community and asked if they would donate their children's gently used clothing to "Open Hands,Open Heart " where we would give them to families for free. We were collecting and storing the clothes in 32 gallon containers. Our intention was to go to the pantry on Saturdays and let families pick through the containers. We soon found that was not a good idea. I got permission from the town of Saco and asked the food pantry if they would allow me to put a 10x40 construction trailer on their property. I needed a wheelchair ramp because it was open to the public. Fortunately, I found a company who built one at no cost to us. The trailer we rented was delivered and set up at no cost to us. When they found out what we were using it for, they decided not to charge us rent. I purchased clothes racks and hangers and, with a lot of hard work, we were able to open our doors in early fall of 2009. I certainly got a lot of support and everything was going in the right direction. Channel 8 came and did a story about OpenHands, Open Heart. I was very grateful for everything that had happened but I knew that we had already outgrown this trailer. My two car garage had turned into a one car garage.I had two neighbors who were letting me use some space in their garage, and some volunteers were taking things home because of all the containers we were filling. I continued to believe it would all work out. In the spring of 2010, I was working at the trailer when I saw a man walking in the backyard and talking to Bob Nichols who was the building manager for Saco Food Pantry. I soon discovered the man's name was Leo Menard. He was a Rotarian from the Saco Bay Rotary Club. It turned out that Leo approached his club to do a community service project which was to upgrade the pantry and build an additional building attached to the pantry for Open Hands, Open Heart. After meeting with the president of Rotary, and, after being a guest speaker at their breakfast club and explaining what I was trying to do, they decided to take on the project. They partnered with the Biddeford, Saco Rotary club and the building began in August of 2010. The Elks Club across the street let us set up the trailer there so we could continue to service families in our communities. We moved into our beautiful building with a full basement in December of 2010.